Want to add another level of sustainability to your wardrobe? Something you may not have considered yet is eco-friendly laundry practices. There are several simple and effective ways to make doing laundry more ethical and sustainable. These practices are also safer and gentler on your favourite wardrobe items and handmade garments. Haven’t delved into sustainable sewing yet or ethical clothes shopping yet? Don’t worry. The advice below can be applied to any wardrobe situation. One of the most effective things you can do to make washing your clothes eco-friendly is washing on cold. The energy it takes to heat up the water for washing accounts for most of the energy cost of running the machine so washing on cold is a huge energy saver. Unfortunately, it is not always ideal to wash in a cold wash. Cold washing is ideal for lightly soiled loads of dark and bright colours. 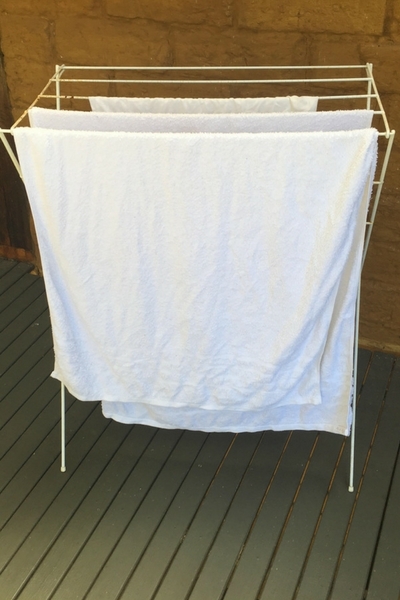 A warm or hot wash is more effective for heavier soiled loads and whites. A warm wash can be a good middle ground for most clothes. Washing in cold water also means you need to pay closer attention to which detergent you are using to ensure it is suitable for a cold wash. There are some fantastic eco-detergents out there I don’t personally use because they are only suitable for warm or hot washes. So, we know we need a detergent suitable for different temperatures but what else should you look out for? Buy in bulk and buy concentrated solutions where possible to cut down on packaging. Biodegradable and recyclable packaging is also a plus. Lots of detergents contain unnecessary filler which you want to avoid as it adds to the amount of packaging produced and the transportation costs. The best way to avoid unnecessary filler and environmental toxins is by shopping for a natural laundry detergent. Using a natural laundry detergent also means your waste water will most likely be safe for your garden. If you don’t already use waste water on it I encourage you to give it a go! Say goodbye to harsh chlorine bleaches and other toxic chemicals in your stain removers and whiteners! There are some great natural ways to remove stains and keep clothes looking bright and fresh. I have found a baking soda paste is a great way to get out most light stains. 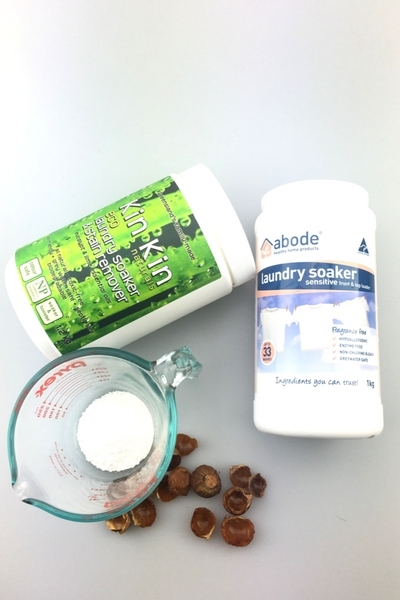 For tougher stains, I use a natural stain remover and soaker which uses sodium percarbonate as a key ingredient. Sodium percarbonate is an oxygen bleach. Oxygen bleach is a safer eco-friendly alternative to chlorine bleach and other stain removing chemicals. It works slower than chlorine bleach but is still highly effective at removing stains and brightening clothes. It is also much kinder to your clothes and less damaging to the fibres. 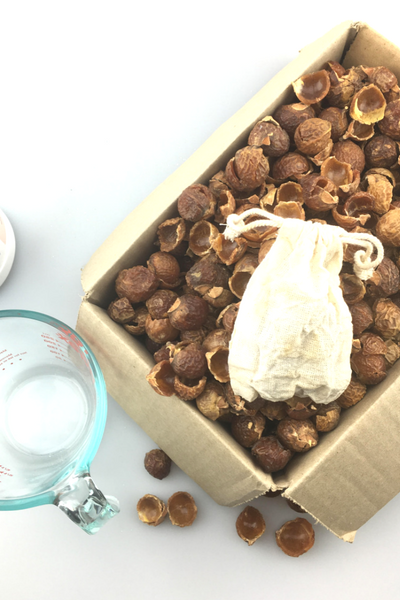 You can use it to make a pre-wash soak or create a paste for targeted application. For heavily soiled loads and general brightening I also use it as a wash boost. Most fabric softeners are not only heavily scented with harmful synthetic fragrances they are also filled with other toxic ingredients that are damaging for your health and the environment. Some fabric softeners can also make your towels less absorbent and cause a residue build up in your washing machine and on your clothes making it more difficult for your detergent to penetrate and clean them next time. The bottom line is, they do more harm than good. For me nothing beats adding a half cup of vinegar to the rinse cycle. Vinegar is easily biodegradable and environmentally friendly. It helps make the laundry fresh and soft without leaving behind a vinegar smell or any residue. Vinegar can also help remove any soap scum build-up in the washing machine and on your clothes, leaving them smelling fresh. If you have sensitive skin this can help your clothes feel less irritating. Normal distilled white vinegar will do the trick, and is cheap! Alternatively, you can go for organic white vinegar to be even more eco-conscious. Sometimes store-bought softeners and even vinegar just doesn’t cut it. This has led to many running towels through the dryer to make them soft and fluffy. While not a very eco-friendly solution if you do fluff your towels like this ten minutes on cool should do the trick rather than using the dryer on hot for a full cycle if you can avoid it. The best eco-friendly alternative for drying clothes is to air dry your clothes on an outdoor clothes line or indoor on a clothing airer/clothes horse. No real surprise there. Many of you who try to live as eco-friendly as possible already do this. I can also understand that with the time pressures of everyday life this is not always an option for many. Especially in the cooler months when clothes will take longer to airdry. If this is you then don’t fret! There are a few simple ways to make sure you are using your dryer as efficiently as possible. Firstly, maintenance! Make sure you clean the lint trap before every cycle. Lint inhibits circulation and causes poor performance. Give the lint filter a wash occasionally to make sure it isn’t clogged with chemicals. Keep an eye on the ventilation system and clean that as needed. If you feel your dryer has started struggling it is probably time to check out the vent, think once to a couple times a year. Keeping the area around the dryer as clean and dust free as possible also help. 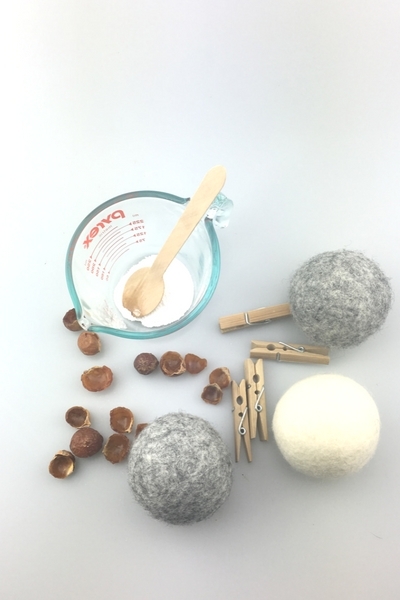 If you want to improve the efficiency of your dryer even more check out wool dryer balls. They are literally balls of wool, slightly bigger than a tennis ball. You simply add them to the dryer with your load to improve heat distribution. This means more efficient quicker drying, saving energy and money! 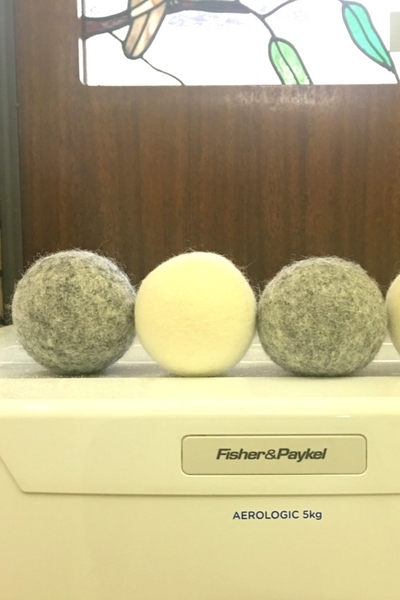 There is also the added benefit of less static when using dryer balls. They are a great investment and will last for years. You can even try making your own if you have some woollen yarn lying around. Speaking of heat distribution, make sure not to overload your dryer! The drum should never be more than three-quarters full otherwise your dryer will struggle to distribute heat and dry your clothes. You also don’t want to put much less than that in as then you will waste energy drying more loads. Cutting down on ironing helps save energy and prevents wear from heat damage to your fabric over time. Besides ironing is boring and takes up a lot of time. I know what you are thinking however, you can’t go out looking like a wrinkled mess! Hanging the laundry as quickly as possible after washing while the clothes are still wet lets the magic of gravity do the work for you. Being strategic and avoiding buying wrinkle prone garments and fabrics can also save you a lot of stress. Store and put clothes away neatly after they are dry. If you take dry washing off the airer or out of the dryer leaving it in a pile to fold later can cause your clothes to winkle up. I hope these tips will help you make your laundry routine eco-friendlier! 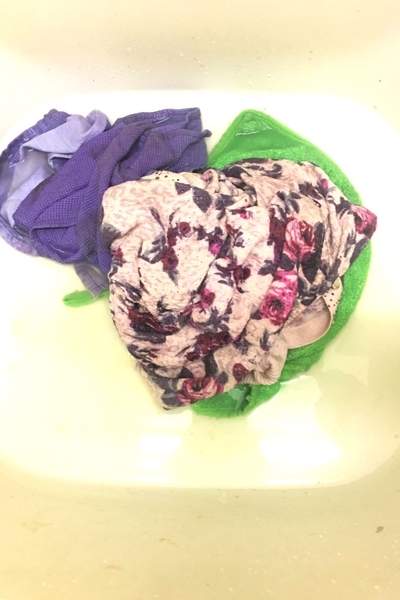 I would love to hear your experiences or if you have any other ways to you make laundry day kinder on the environment. Thanks Lily for this comprehensive post! I hope that you’ll find some of the advice useful, I certainly have.